EtusivuDoes simultaneous cardio- and resistance training compromise training adaptations? A pioneering study in combined endurance and strength training was conducted by Robert C Hickson in 1980 (2) and revealed that maximal strength performance may be compromised when a high frequency of endurance and strength training is performed concurrently, a phenomenon called “interference”. In this early investigation strength performance only developed as expected during the first 4 weeks of a combined training program but then leveled off, and after 8 weeks even decreased in comparison to a group performing strength training only (Fig 1). Interestingly, no between-group differences were observed for adaptations in endurance performance. Fig 1. 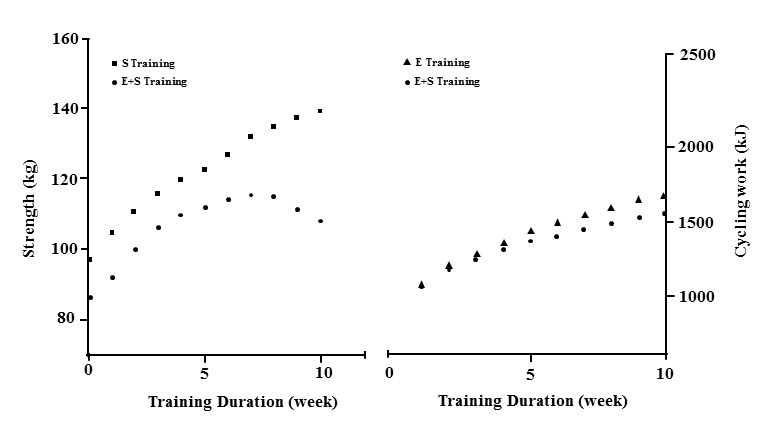 Strength (left) and endurance (right) development during strength (S) or endurance training (E) only and combined endurance and strength training (E+S) over 10 weeks (reproduced from 2). While reflecting pretty well what is typically observed when combining a high frequency and volume of endurance and strength training into the same training program, it needs to be pointed out that this phenomenon of decreased strength development is typically only observed when a very large number of both endurance and strength training sessions are performed in a week (as in the case of Hickson’s study: as many as 5 strength and 6 endurance training sessions per week). Recent studies from our Department also showed that during more realistic training programs for physically active but systematically untrained populations, consisting of a much lower training frequency (i.e. 2-3 sessions endurance and strength, respectively), adaptations in strength- and power development as well as muscle growth are not compromised (1). In line with the fear of many recreational sportsmen, some previous studies (e.g. 4) have shown that prolonged and intensive endurance performance may acutely reduce the quality of a subsequent strength training session (e.g. as measured by the number of repetitions performed), and thus possibly negatively affect optimal training adaptations. However, typically in these studies, performance decrements are measured by means of maximal loads (e.g. repetitions to failure), which does not necessarily reflect typical training praxis, especially during the early phases of a training cycle. In two of our recent studies we aimed to investigate the effects of a well-planned combined training program progressively increasing in intensity and volume over 24 weeks, starting each training session either with endurance or strength training. We showed that during the early phase of the training (in an untrained state), kicking off the training session with endurance cycling induces less favorable anabolic responses when compared to the opposite exercise order (7). This was especially indicated by reduced concentrations of serum testosterone during recovery for up to 2 days, which may reflect a non-optimal environment for muscle growth and strength development. Importantly, this initial difference between the recovery times of the two exercise orders was no longer observed after the 24 weeks of training (7), and both groups actually increased physical performance and muscle size to a similar extent (6). Based on these findings, we concluded that the exercise order of periodized combined cardio- and resistance training does not seem to have an effect on biological adaptations, leaving the exercise order up to personal preference. However, since in the early phase of the training the recovery of the group starting with cardio was prolonged, caution should be paid when performing high amounts and/or a high frequency of training. According to our findings, performing 2-3 combined cardio- and resistance training sessions per week, of 90-120 min each, does not induce differences in the adaptations of overall fitness and body composition between the two training orders. It is commonly understood that the key to successful training adaptations is sufficient recovery between subsequent training sessions. Interestingly, while this certainly holds true during intense training cycles, a recent investigation by our group has shown that it may not be a major performance determinant for physically active but systematically untrained men performing the same volume of combined cardio- and resistance training either on the same or on separate days (3). In this study we have shown that the training adaptations in muscle strength (Fig 3), muscle growth and endurance cycling performance are independent of the combined training mode performed. Fig 2. 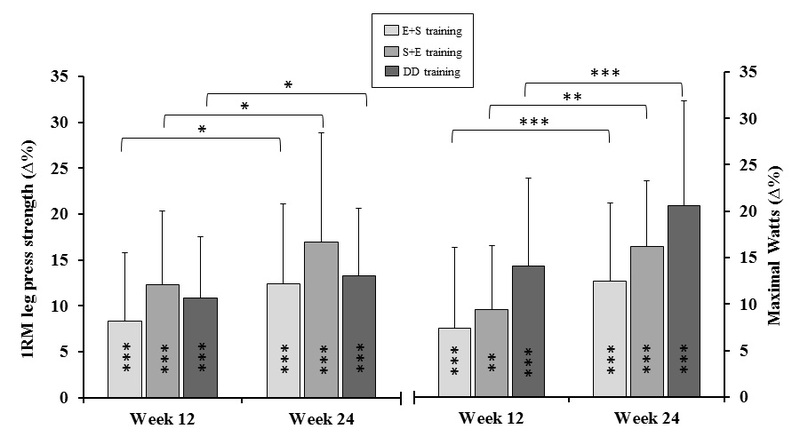 Changes in 1RM strength (left) and endurance performance (right) following 24 weeks of combined endurance and strength training performed on different days (DD) or the same day starting with endurance (E+S) or strength (S+E) in young men (reproduced from 3). As the analysis of the data coming from this study is not yet completed, the explanations for these findings are speculative. Importantly, the training program used in this study was the same as used in our previous studies (6, 7). While we utilized the training principle of progressive overload, caution should be paid when introducing heavy training loads or high endurance training intensities during an early phase of the training as these training sessions may require extended recovery periods for adaptations to take place, and may in turn lead to different training outcomes than those observed in our study. Moreover, the participants in this study were training inexperienced, providing a relatively large window of adaptations irrespective of the training mode performed. Whether similar findings would be observed in athletic groups remains to be investigated. Although some endurance coaches still believe that supplementary strength training, often conducted as circuit training with very low loads, is mainly required for injury prevention, a growing body of scientific knowledge indicates this view to be outdated. Several studies, particularly within the last decade, have shown that maximal and explosive strength training added to endurance training programs of both moderately and highly trained endurance runners and cyclists may actually induce remarkable endurance performance benefits (Table 1). Although the absolute gains in muscle strength are rather small due to the high volume of endurance training performed, a recent review suggests especially neuronal strength training to improve maximal and sub-maximal endurance performance via improved neuromuscular efficiency, increased force generating capacity and delayed recruitment of type II fibres, as well as a conversion of fast-twitch type IIx fibres into more fatigue resistant type IIa fibers (5). Table 1. Effects of maximal and explosive strength training on endurance performance (reproduced from 5). Typically the strength training should be initiated with a training frequency of 2 sessions per week but this frequency may be periodically decreased to 1,5 or 1 sessions without compromising the effectiveness of the training program. However, in contrast to our studies in previously untrained individuals, we recently provided evidence for strength training losing its benefits for recreational endurance runners when the resistance training protocol is performed immediately after an endurance running session of moderate intensity and duration (8). Therefore, endurance athletes should be advised to separate endurance and strength training sessions as much as the training program allows. I hope that the present summary emphasized that combining endurance and strength training does not compromise endurance and/or strength development when the frequency of both training modes is low to moderate. Furthermore, I meant to show that the mode of concurrent training does not seem to be of great importance for physically active individuals, providing that a progressive training periodization is utilized. Importantly, while combined training programs are the essential base for overall fitness and health improvements, especially in sedentary men and women, endurance athletes should also be encouraged to incorporate strength training sessions into their endurance training programs in order to gain valuable performance benefits. Häkkinen K, Alen M, Kraemer WJ, Gorostiaga E, Izquierdo M, Rusko H, Mikkola J, Häkkinen A, Valkeinen H, Kaarakainen E, Romu S, Erola V, Ahtiainen J, Paavolainen L. Neuromuscular adaptations during concurrent strength and endurance training versus strength training. Eur J Appl Physiol. 2003; 89(1):42-52. Hickson RC. Interference of strength development by simultaneously training for strength and endurance. Eur J Appl Physiol Occup Physiol. 1980; 45(2):255-63. Eklund D, Pulverenti, T, Bankers S, Avela, J, Newton RU, Schumann M, Häkkinen K. Neuromuscular adaptations to different modes of combined strength and endurance training. Accepted for publication Int J Sports Med. 2014. Leveritt M, Abernethy PJ. Acute effects of high-intensity endurance exercise on subsequent resistance activity. J Strength Cond Res. 1999; 13(1):47-51. Ronnestad BR, Mujika I. Optimizing strength training for running and cycling endurance performance: A review. Scand J Med Sci Sports. 2013. Schumann M, Küüsmaa M, Newton RU, Sirparanta AI, Syvaoja H, Häkkinen A, Häkkinen K. Fitness and Lean Mass Increases during Combined Training Independent of Loading Order. Med Sci Sports Exerc. 2014; 46(9):1758-68. Schumann M, Walker S, Izquierdo M, Newton RU, Kraemer WK, Häkkinen K. The order effect of combined endurance and strength loadings on force and hormone responses: effects of prolonged training. Eur J Appl Physiol. 2014; 114(4):867-80. Schumann M., Mykkänen OP, Doma K, Mazzolari R., Nyman K, Häkkinen K. Effects of endurance training only versus same-session combined endurance and strength training on physical performance and serum hormone concentrations in recreational endurance runners. Appl Physiol Nutr Metab. Published online 15.09.2014.